Properties in Sagadahoc County average 4.8 out of 5 stars. Bayfront cabin w/ incredible views & shared dock - ideal for hunting/fishing! Property 3: Bayfront cabin w/ incredible views & shared dock - ideal for hunting/fishing! Your own private island! Rustic and close to Nature. Property 14: Your own private island! Rustic and close to Nature. Loony Bin Cottage - A stones throw to the water's edge. Property 15: Loony Bin Cottage - A stones throw to the water's edge. Enchanting Five Islands - Home of the biggest lobsters and deep water for boats! Property 16: Enchanting Five Islands - Home of the biggest lobsters and deep water for boats! Private and Convenient Audubon Bring Your Fishing Pole! Property 19: Private and Convenient Audubon Bring Your Fishing Pole! Property 20: Private waterfront home w/ large deck and deep water dock! 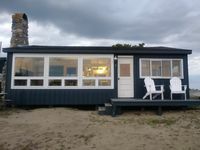 3 bedroom cottage only 187 steps away from Popham Beach! Property 27: 3 bedroom cottage only 187 steps away from Popham Beach! NEW LISTING! Waterfront cottage on the beach w/views of ocean and lighthouses! Property 34: NEW LISTING! Waterfront cottage on the beach w/views of ocean and lighthouses! Beautiful Cottage On Water, Near Beach!! Property 35: Beautiful Cottage On Water, Near Beach!! Coastal Island Retreat - Privacy and Convenience. Boat rental available. Property 39: Coastal Island Retreat - Privacy and Convenience. Boat rental available. 2 oceanfront Cottages with spectacular views and direct water access. Property 42: 2 oceanfront Cottages with spectacular views and direct water access. We had a wonderful time staying in Jame's cottage! The bunk house was very sweet and we all wanted to be in there! We explored Hermit Island and Morse Mountain. Such a great location! Thank you! It was our first time to this area and found it to be a gorgeous place.The beach was perfect and I loved being able to walk as far as I wanted on a daily basis. It was very convenient running into Bath a couple of times to get things we needed in town. We found Plants Seafood in Bath a great place to get seafood. They had fantastic fresh crab meat which is something I like to get every time we come and stay on the coast of Maine. We found Deb very nice to work with and she was very helpful with several things was asked her about. The cottage was well stocked and the fireplace was nice to have on the cool nights we had as was their heater. The tap water is very good and we didn&rsquo;t need to buy drinking water which was nice. The only things I&rsquo;d recommend they add to the cottage is a dish rack tray for under the dish rack seeings we have to hand wash our dishes and we cooked daily. It would have been nice to have better privacy curtains on the back of the cottage in the back bedroom, kitchen and bathroom for more privacy. We felt like there was no where to undress and felt very exposed a night. Other then that we really enjoyed our stay and plan to stay there again next fall.